If you happen to be in the Decatur, GA area over Labor Day Weekend, come on out to the Decatur Book Festival! The Street Fair Hours are Saturday, Sept 4 from 10am – 6pm and Sunday, Sept 5 from 12pm – 6pm. The Eckerd College Writers’ Conference will be located at Booth #527, so, stop on by! For those of you conference alumni out there, don’t forget to keep us up to date on your writing successes! Email the details to the conference coordinator (cayacr@eckerd.edu) and we’ll share your good news on this blog. Congratulations to Athena Sasso (WIP ’08 – ’10) whose short story “The Account in Question” was a finalist in Glimmer Train’s April 2010 contest (Honorable Mention). Her flash fiction piece “Made Me Look” will be published in the 30.1 issue of Existere Journal of Arts and Literature, Fall 2010/Winter 2011. Some of our alumni have been very busy lately. Lily Prellezo, Karina Berg Johansson, and Lori Roy all have books slated for publication in the coming months. As we get closer to the publication dates of each of these fine works, check back here for interviews with the authors. And, of course, pick up some copies! We are so proud of these talented writers! Congratulations to WIP Alumna, Amber Robinson (WIP ’09). 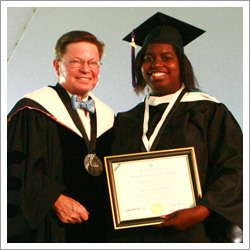 At the 2010 Eckerd College Commencement, Amber received The Miller Award. Good luck on all your future endeavors! The Miller Award is presented to the senior student whose life activities exemplify the ideal of unselfish and public-spirited service to the community, off campus as well as on campus. 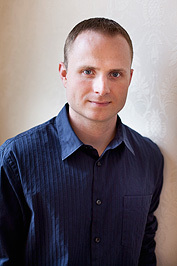 This year’s recipient is from St. Petersburg, Florida and graduates with a Bachelor of Arts in Literature. She has served as a Resident Advisor, as Vice President of the Law Club, as Financial Advisor for the African-American Society, as a member of Amnesty International, and as a member of the Constitutional Regulations and Bylaws Committee of ECOS. Last year she was news editor for The Triton, Section Editor for The Eckerd Review, and a member of the Eckerd Tennis Club, Model United Nations, the Eckerd Recycling Team, and the Multicultural Dance Club. She is currently involved in a year-long internship at a law firm. She has served as a volunteer at the Florida Holocaust Museum where she is currently a tour guide and was awarded the Florida Holocaust Museum Anne Frank Humanitarian Award. In addition to all these endeavors, she has maintained an excellent academic record with a GPA of 3.89. She has been accepted to several law schools including Michigan State, Howard, and Georgetown and is looking forward to continuing her study of Constitutional Law. Photo and information on Miller Award Courtesy of Eckerd College 2010 Commencement. You are currently browsing the Writers in Paradise Alumni blog archives for August, 2010.